When Gerry sent out the email revealing his choice for our most recent adventure, there were doubts among us of its authenticity. His first obviously mock pick, for some reason known only to Gerry, was a fictional restaurant in Brewster, Massachusetts. Even Zio, who has been slow, as he is on most things, in recognizing Gerry’s much too subtle sense of humor, knew that we weren’t schlepping five hours to Cape Cod for dinner. Port Chester is approximately 24 miles from Manhattan. Gerry has had us put on the mileage before; taking us to Yonkers, Valhalla, White Plains, Fort Lee, Jersey City, and, worst of all, Sheepshead Bay, Brooklyn. When it’s Gerry’s pick, we come to expect to battle the rush hour traffic leaving the city. Apparently, Zio wasn’t going to take it anymore, yet when the day arrived, his attitude changed and he not only agreed to travel to Port Chester, but to chauffeur me up there with him. Rick, however, who lives roughly 77 miles from Port Chester, was a game day drop out. Attributing his cancellation to a late work-related meeting, Rick needed no excuse. He was more than justified in bowing out—Gerry’s cruel joke could be taken only so far. Zio and I expected a long haul up to Port Chester but as it turned out during this rush hour, there was no rush. The roads were surprisingly clear and we made it to the stark streets of Port Chester several minutes before the scheduled meeting time. Those few minutes gave Zio and I time to take a look at the nearby eating offerings of Port Chester. 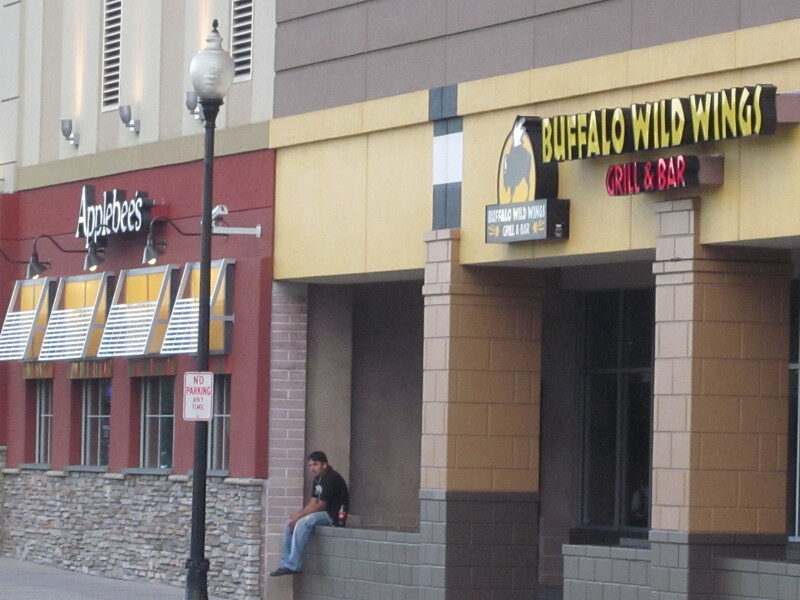 Besides El Tesoro II, which claimed two Central American countries; Guatemala and Salvador as the cuisines featured, there were a couple of Peruvian diners, a chili dog dive, and, across the street where a monstrous, correctional facility-like mall stood, there was an Applebee’s and a Buffalo Wild Wings. Two of Port Chester’s inviting eateries. We passed a window where numerous colorful parrots frolicked at the Bird House of Westchester, and then entered El Tesoro. There were birds inside the tropically adorned restaurant as well, but these were chickens and they were stuffed. 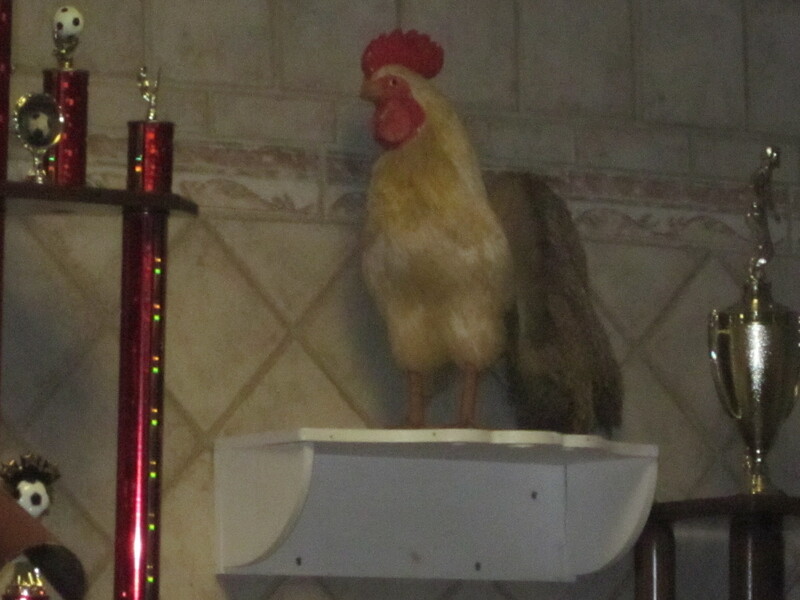 One of the several stuffed hens at El Tesoro. Our waitress, who Eugene, executing one of his lamer lines, asked if she claimed Italian heritage, revealed that she was, in fact, not from Guatemala or Salvador, but that she was from Honduras. And if there was a difference in the cuisines of the three Central American countries, she wasn’t telling us. 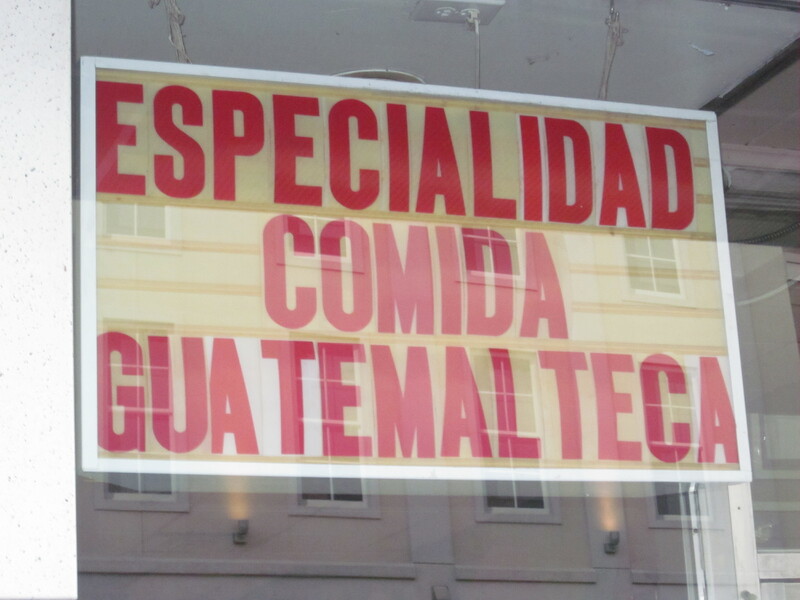 Guatemala or Salvador? Which is it? 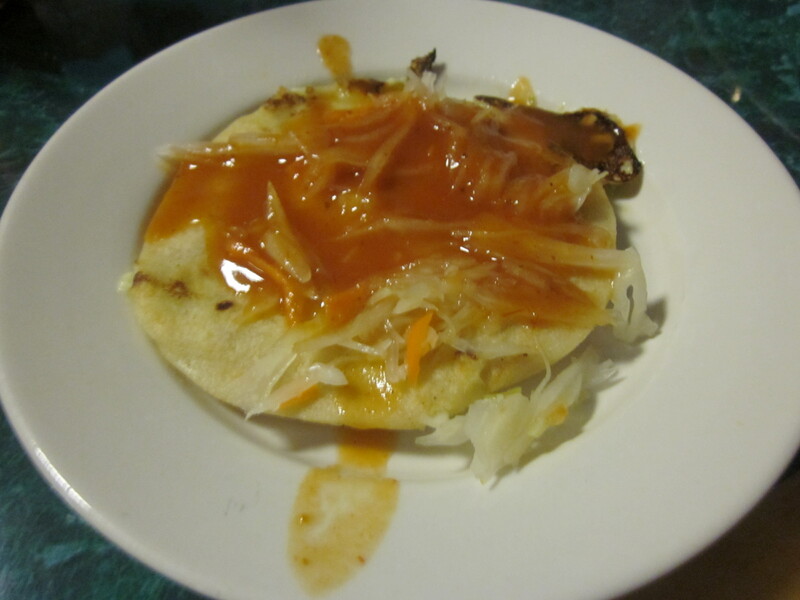 From the Salvador-labeled section of the menu were the well-known pupusas which we celebrated many years ago at a restaurant in Washington Heights that still survives called: La Cabana Salvadorena. (See Pupusa Love). As I vaguely recall, the pupusas were worth loving there and we had to try a few at El Tesoro. No love for the pupusas of El Tesoro. 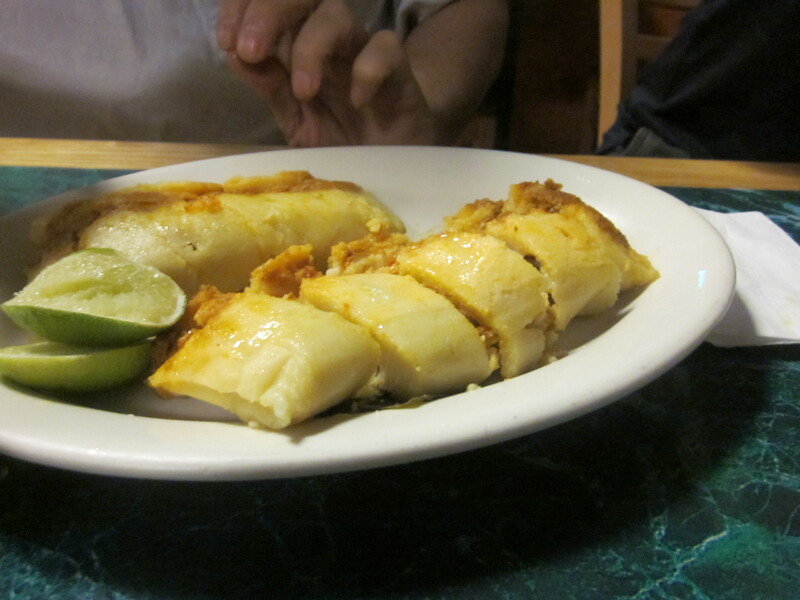 Also from the Salvador starters section were the tamales while, representing Guatemala, were the rellenitos, which Gerry bravely ordered. 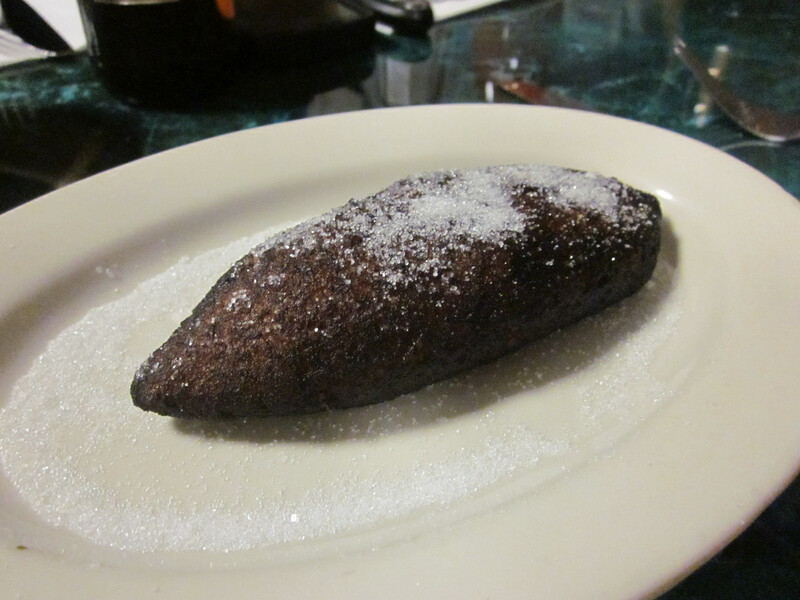 Our waitress described them as platanos (plantains) stuffed with beans. What she didn’t say what that the rellenito was of the sweet variety, deep fried and then sprinkled with granulated sugar? Even with the presence of the beans, you really just wanted to take the thing and dunk it in your coffee; it was that sweet. Maybe Dunkin Donuts should consider adding the rellenito to their doughnut menu? 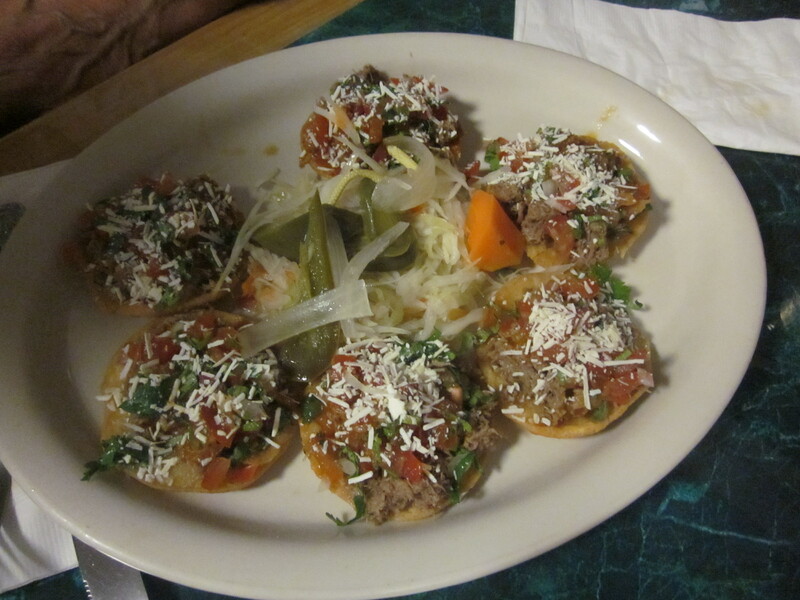 Eugene ordered the garanchas; tiny tortillas topped with beef, cheese and the Guatemalan version of pico de gallo, which, after sampling one, did not live up to the more familiar Mexican version. As we proceeded to sample the food, what we tasted, unfortunately were mediocre replicas of the major influences from the north (Mexico) and the south (South America). The carne guisada I ordered, familiar to me at other Latin restaurants as beef stew, was, here, more like ropa vieja; shredded beef in a very bland tomato sauce. “It’s mushy,” Zio commented about the tamale. “I like Mexican tamales better.” The tamale was dense with corn masa and stuffed with pork but Zio’s description was accurate. It was mushy. 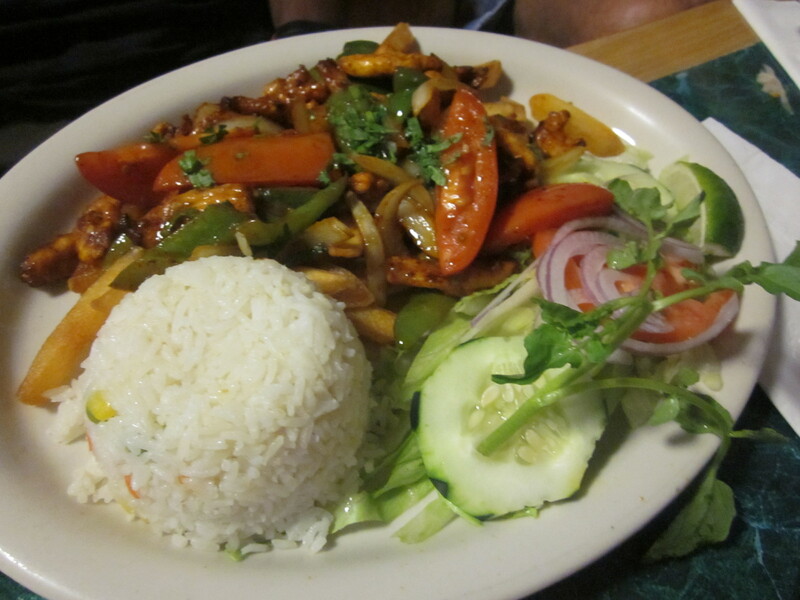 Mike from Yonkers did not expect potatoes added to the rice in his pollo saltado, the Guatemalan attempt at the Peruvian specialty. “Too much starch,” he said and, in a rare display, put his fork down well before his usual meticulous cleaning his plate. Zio had ordered the pollo frito in what the menu described as “our secret seasoning.” He offered a wing and/or leg of the chicken to any takers, but there were none. “The fried chicken was really dry,” he confessed to me on the way back to the city. I’m not sure what was expected of the chile relleno Gerry ordered, but again, what I tasted of it was a poor man’s version of the Mexican dish. The flavor, or lack therof, just not what any of us were accustomed to. 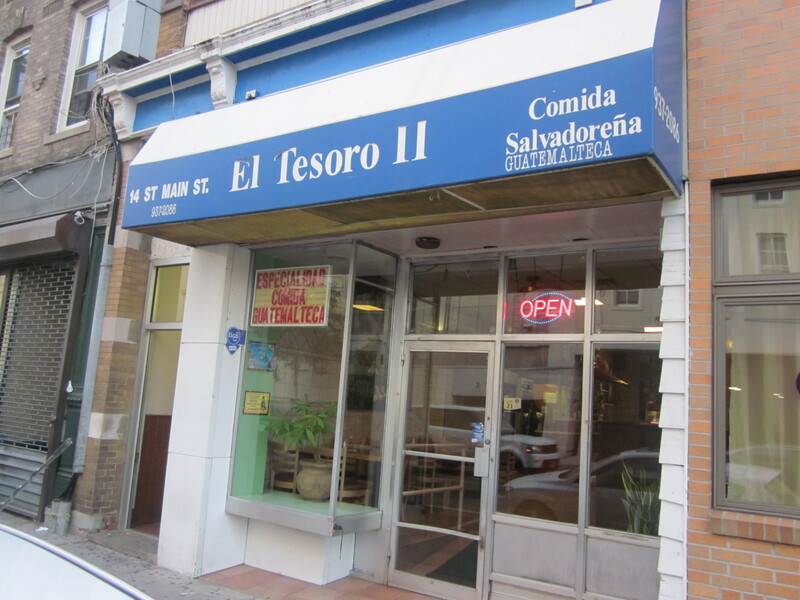 Things weren’t all lackluster at El Tesoro. 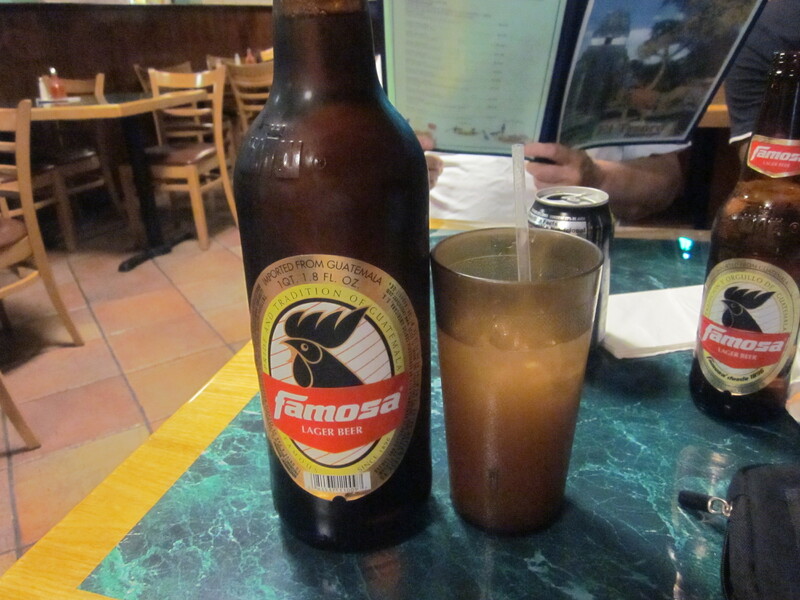 The Famosa beers were cold and delicious. The service was cheery. Even the incessant screeching of a toddler added life to the otherwise drab Port Chester experience and, not that it was what I was seeking, made me feel right at home.